The Florida Keys are home to an abundant population and a variety of species of sea turtles. While there’s no guarantee you’ll spot one in the wild at the reef, a visit to the Key West Aquarium promises educational encounters with sea turtles. There’s a lot to learn about these majestic aquatic creatures, so read on for our ultimate guide to sea turtles. There are a total of seven species of sea turtles. The most common types in the Florida Keys are the loggerhead, followed by the green sea turtle, hawksbill and Kemp’s ridley. The loggerhead is distinct for being the world’s largest hard-shelled turtle with adults weighing an average of 180 to 440 pounds. They’re identifiable by their large heads that are usually a yellowish color with red-brown spots. The green sea turtle can be misleading since these turtles are usually black or dark brown in color. They’re very similar in appearance to loggerheads, weighing in between 150 and 420 pounds on average. They get their name from a green rim of fat found in their shell. The hawksbill is a smaller sea turtle that averages about 180 pounds as an adult and is recognizable for its beak-like mouth (hence the name) and its amber and black patterned shell. Weighing no more than 100 pounds and olive-grey in color, the Kemp’s ridley sea turtle is one of the smallest sea turtle species. They’re also incredibly rare and fall on the critically endangered list. Led by resident veterinarian Dr. Douglas Mader, the Key West Aquarium runs a Sea Turtle Conservation program. Here, they rehabilitate sea turtles that have been injured in the wild. During a special guided tour of the aquarium, you can encounter four species of sea turtles and meet Spike, a loggerhead that weighs in at 275 pounds. Nearly all sea turtle species fall into the threatened category, which ranges from critically endangered to endangered and vulnerable. The biggest threats to sea turtles are the loss of habitat, pollution, and predators. The Kemp’s ridley and hawksbill sea turtles are on the critically endangered list, the green sea turtle is endangered and the loggerhead is vulnerable. Loss of habitat is often caused by human impact and coastal development. Of the many pollutants that make their way into the ocean threatening the health of sea turtles, plastics are particularly disconcerting as they often look like jellyfish floating in the sea, which sea turtles mistake for food and then choke on. Sadly, sea turtles are still hunted and poached in some parts of the world. Natural predators range from mammals raiding their nests on land to tiger sharks in the sea. 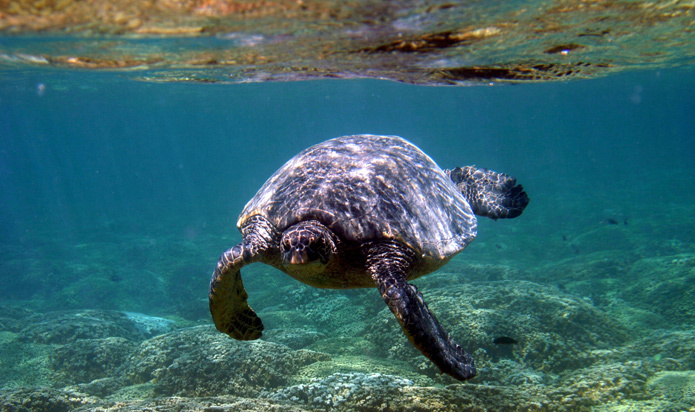 Sea turtles are air-breathing reptiles that live most of their lives swimming in salt water. The only time they come on land is during nesting season when females lay eggs on the beach. Nesting season begins in March and usually lasts until October. When baby sea turtles hatch 50 to 60 days after they’ve been laid, they’re only three inches long. They have a natural instinct to crawl from their nest on the beach to the sea without any guidance to start their lives of ocean dwelling. There’s something undeniably disarming about sea turtles and they’re an absolute thrill to spot in the wild. While they’re a somewhat rare sighting, it’s not at all out of the question to see one (or even a few!) on a snorkeling or glass bottom boat excursion to the coral reef. While on the boat, keep your eyes on the surface of the water for bubbles or a splash and the unmistakable outline of a loggerhead’s large head before he dives deep beneath the sea. While snorkeling, they may swim past you slowly and gracefully under water for the ultimate thrill. See how long you can keep up swimming with them.